Happy weekend! 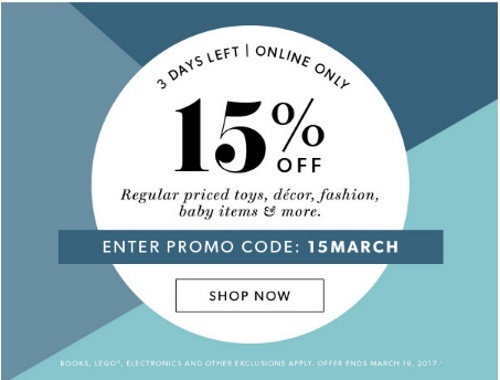 Chapters Indigo is offering 15% off regularly priced toys, decor, fashion, baby items and more! Enter the promo code 15MARCH at checkout. Valid online March 25-26, 2017 at 3am ET. Not valid in-store or on kiosk orders. Offer excludes books, sale items, all electronics and accessories (including Apple and Kobo), LEGO products, Kate Spade New York products, American Girl products, Shinola products, Rosetta Stone products, Used Books, Love of Reading Donations and gift cards.